For Line-Haul operators; CartonCloud supports Multi-Leg Consignments to allow jobs to span multiple stages (Delivery Runs / Run Sheets), while allowing each leg within the job to be altered, signed for, charged and/or billed independently. For instance, you may be moving a Pallet from Brisbane to Melbourne (via Sydney). The consignment is going onto multiple line-haul carriers / onforwarders, and each will raise their own bill for their ‘leg’. Multileg Consignments can be constructed to charge the customer either a single charge for the whole job, or charges for each 'leg' when creating an Invoice. Individual legs can also be billed from the relevant carriers through Bills. Each 'Leg' within the Multi-Leg Consignment is a Consignment itself, so it will appear in all lists as a Consignment for allocation or invoicing. Creating Multi-Leg Consignments is a manual process. Unlike regular (single-leg) consignments, Multi-Leg Consignments cannot be created from spreadsheets imported via email, or other automatic methods. Begin by creating the Multi-Leg Consignment by creating a consignment from Transport -> Consignments -> Add New Consignment. Fill out the regular address details, however before clicking 'Save', expand the Advanced Options and select 'Multi-Leg' as the Consignment Type. You’ll then be prompted to fill out 3 other fields: Delivery Run, Income Rate Zone and Expense Rate Zone. When creating a Multi-Leg Consignment, the Initial Consignment created is the First Leg of the Multi-Leg Consignment. Therefore, the Delivery Run, Income Rate Zone (how you charge the customer), and Expense Rate Zone (how you pay the carrier) selected on this page apply to the First Leg Only. Carrying on with the example of the Brisbane to Melbourne Pallet, it’s likely you’ll want to charge the customer a single charge for transporting the pallet from Brisbane to Melbourne (as opposed to charging them once for Brisbane to Sydney, and again for Sydney to Melbourne). 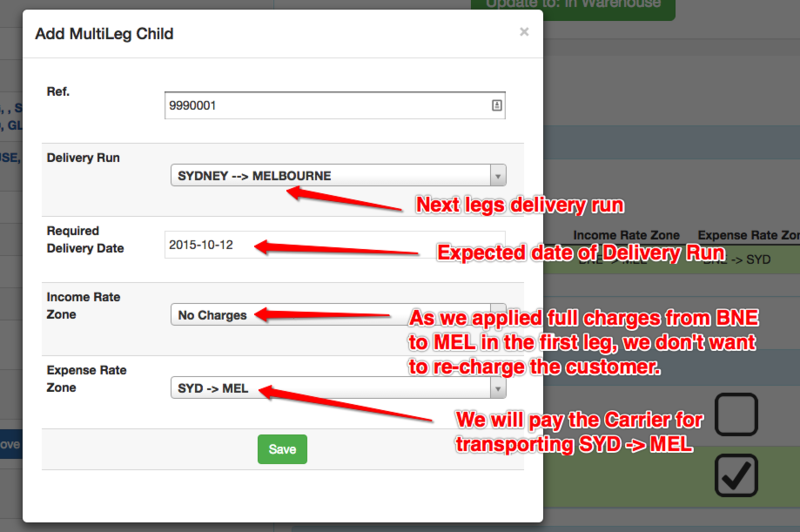 To charge the customer once only for the whole trip, you would use the rate zone BNE->MEL for the First Leg (this way the customer only sees one charge, for transporting the consignment from Brisbane all the way to Melbourne). However for the Expense Rate Zone (what you pay onforwarders or other carriers), you will need to apply individual Rate Zones to each leg of the journey as each leg may be handled by a different carrier. If you have already charged the customer the full price on the first Leg, as we have done in the example, then subsequent legs should be given the Income Rate Zone of No Charges. This will prevent the customer from being charged more for the subsequent legs. If your Multi-Leg Consignment contains two or more legs, you can re-order all legs other than the first* by dragging the consignments up and down. Multi-Leg Consignments can be modified once the job is underway, you can easily add, edit, or delete legs. If you suddenly find a cheaper method of freighting from Sydney to Brisbane for example, you can switch the job to use this instead. * Due to the way in which Multi-Leg Consignments are designed, the first leg must always remain the first, and therefore cannot be moved.